All of the volunteers I have crossed paths with in my role at Common Threads, the nonprofit organization that I co-founded, have one thing in common -- passion. When individuals have an opportunity to advance a cause they are passionate about, it is a powerful thing. It's clear that people want to work for good -- 91 percent of Gen X women and 76 percent of Gen X men think it's important to contribute to their local or global community through work. 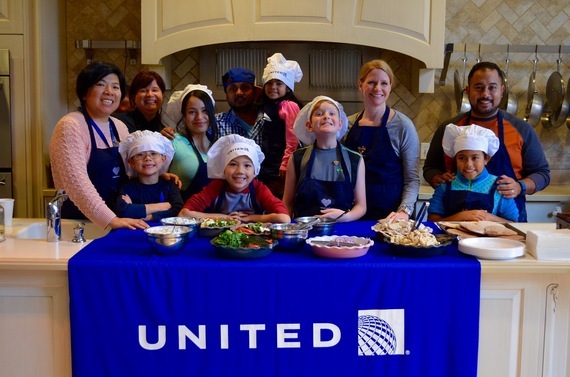 United employees attend a Common Threads' cooking class. Mike Denman, Global Business Manager at Microsoft, volunteers his time and skills by serving on Common Threads' National Board and explains that he was drawn to the nonprofit because of his interest in healthy living, but finds it fulfilling in so many ways. "Serving on the Board gives me an opportunity to devote time and resources to something where I feel like I can have a tangible impact. While many people contribute to a variety of groups and organizations, sometimes we struggle to see the direct impact of our efforts. By serving on the Board and being involved with a number of initiatives, including the technology efforts, I am close enough to see how we are impacting the kids. This is humbling and it is also inspiring when you see what the kids are capable of." The role of volunteering is a complex. Individuals seek out opportunities to give back in a meaningful way and those opportunities often come through their employers. Keeping employees satisfied and fulfilled is crucial to a company's growth and stability; some of the most successful companies are also the most socially responsible. Corporations know that employees and customers care about how they are giving back to society. A study conducted by the Reputation Institute on 47,000 consumers found that 42 percent of people's feelings towards a corporation are based on how socially responsible it is. Execution of philanthropic efforts is evolving; bringing greater benefits to companies, nonprofits and other organizations, employee volunteers, and society. Last year, I covered new trends in corporate social responsibility (CSR) practices and a fast-growing component of CSR is employee volunteerism, specifically skills-based volunteering (SBV). The CEO of Green ABCs, Beth Davies, has more than a decade of experience in the field as the former Global Vice President of Corporate Relationships at Guinness Company and Head of Marketing and Communications at Committee Encouraging Corporate Philanthropy (CECP). Davies explains, "We are seeing the evolution of CSR from a disparate and random investment footprint to the strategic value aligned promotion." Davies refers to this new paradigm as "corporate societal investment with an enlightened self-interest." SBV is driving the shift. SBV has changed the volunteering playing field for the better. Rather than the traditional, one size fits all approach; efficiency is maximized under the new model. Companies are engaging their employees to provide critical value in their fields of expertise -- the company's and the employee's. According to their website, PWC launched Earn Your Future (EYF) in 2012, a multi-year commitment that has now been increased to $190 million and is focused on helping students develop critical financial skills while providing educators with the resources and training to teach those skills. The company and their charitable arm recognize their unique position and ability to contribute to the financial security of the future. The initiative -- which utilizes multiple forms of philanthropic methods, including strategic partnerships, funding, curriculum modules, and service hours -- resulted in equipping 2.5 million youth and educators with skills to contribute to a healthier US economy. By focusing on what they do best they have maximized their efficiency and made a more significant impact. "Those companies and businesses who are aligning their societal investment against their core offering and value proposition will realize a greater return on these investments against all metrics," says Davies. Benefits include greater authenticity to stakeholders and the public, as well as the ability of employees to leverage their talents against personal and corporate goals. IBM is another example of a company deeply engaged in giving back in this progressive way. According to Sandy Dochen, Manager of Corporate Citizenship and Corporate Affairs at IBM, their main venue for volunteering is the On Demand Community, a website for employees and retirees to identify opportunities, track volunteer hours, apply for Community Grants, and find information on their Matching Grant program. They have had success with this as well as other avenues, including Business Resource Groups and ad hoc opportunities. One of their more successful and sought-after programs is Corporate Service Corps -- where employees are selected to consult in an emerging market country. The most common skills that IBM employees offer nonprofits include IT services, data management, discussion of work in STEM, technology planning, marketing and communications, and time management. Dochen explains that from their feedback they know that nonprofits appreciate IBM volunteers' "business process knowledge, financial expertise, marketing, planning," and more. According to a Gallup poll on the State of the American Workplace, 70% of US workers feel disengaged from work. On average, a disengaged employee costs $2,246 per year in decreased productivity and, for some unhappy employees, active undermining of the company. The two main reasons cited are that work is not meaningful and employees are not experiencing growth and improvement. Davies says that, "companies hoping to engage, entice, and retain the best of the next generation of workers need to look at CSR as a powerful tool to provide meaningful opportunities for employees to give back to society." IBM has found this to be true, and Dochen explains that many newer IBM employees report joining the company in part to have a chance to apply for their Corporate Service Corps. SBV is a great way for employees to avoid the stagnant 9-5 cycle that can lead to disengagement. In fact, three-fourths of professionals who engage in SBV feel healthier and less stressed. An even higher number develop their skills and feel closer with their co-workers. SBV offers employees a chance to improve themselves and feel good about where they work. "Being a dietitian during the world's largest obesity crisis can be overwhelming, but one way I've been able to roll up my sleeves and help make small changes is through Common Threads," said Marlene Schmidt, a National Board Member for the organization and Nutrition Health & Wellness Manager, Nestlé USA. She has been able to use her unique skill set to help students learn about making healthy food choices in her role on the board and has found that kids find cooking fun, they just need the skills and knowledge. That kind of work is fulfilling. A study conducted on Employee Skills-Based Volunteerism (ESBV) at IBM and other companies found that those employees involved reported higher satisfaction and increased morale, and had enhanced retention rates than those who did not. Employees at IBM also reported growth in invaluable areas -- global leadership skills, network ties, cultural intelligence, and organizational commitment -- after ESBV program. (CSR: A Case for Employee Skills-Based Volunteering) Not to mention, IBM reported $5M in new business resulting from its CSR programs. 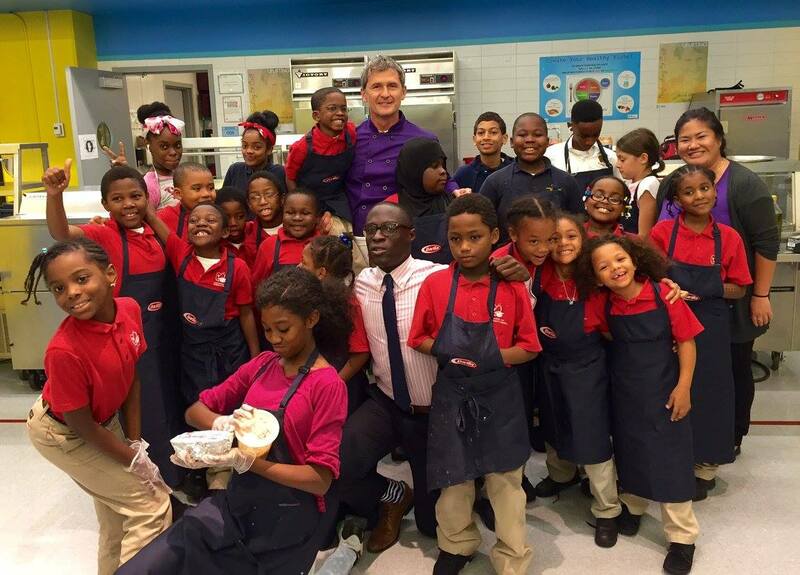 Barilla Chef Lorenzo Boni and employees volunteered their time to cook with Common Threads' students. "Some people like to do something totally different from their usual job when they volunteer, like paint, build or work with a different group of people. Others like to fully engage their professional skills. I think there's room for both," said Alexandra Baird, Marketing and Communications Manager for Chicago Cares, a leading Chicago nonprofit that connects people, communities, and causes through volunteerism. "Skills-based volunteering is great for companies, as it gives them a way to not only get their employees volunteering, but it doubles as a professional development opportunity." Dochen has also seen these benefits firsthand at IBM, where management understands that giving employees an outlet to do good in the community is "fulfilling to the IBMer, both in work, life, community integration as well as leadership skills learned that are applied to their jobs, thus providing overall growth." SBV is a great way to transform employees into leaders. International Corporate Volunteerism is a leadership training method that is more effective than programs specifically tailored to train corporate leaders--and it promotes social change. Corporations are obviously not the only ones benefitting. Dochen describes what he calls the "Triple Benefit." The nonprofit or other beneficiary organization is enriched by the skills and time donated, as well as any applicable cash as part of the Community Grant and/or Matching programs; IBM employees make a meaningful contribution and benefit from the experience; and IBM is enriched by all that the employee gains and brings back to the company. Kabir Kumar, Sr. Director, Community at Walmart reports that Walmart's Volunteerism Always Pays (VAP) program, which allows employees to apply for grants on behalf of their volunteer hours at eligible organizations, generated $14 million in grants in FY2015. "The VAP program is so successful because it allows one of Walmart's strongest assets, our associates, to take the lead and contribute to local causes that they know will make an impact on their communities," said Kumar. In FY2015, more than 76,000 Walmart associates participated in the program and volunteered more than 1. 5 million hours of time. "We encourage our associates to contribute their time and talent to charitable organizations that matter to them by providing grants to eligible community organizations, based on the hours volunteered. No one knows the communities we serve better than our own associates, and their passion in giving back is what truly allows us to make a difference." Nonprofits can take advantage of companies with volunteering programs. In addition to strengthening ties and increasing donations from engaged companies, they can also get connected with companies and foundations that may support the nonprofit's efforts. By working with skilled volunteers, nonprofit employees can accumulate new skills and grow alongside professionals. SBVs, in many cases, choose to volunteer for the nonprofit--they are supporters. Within my own organization there are multiple instances of volunteers turning into employees. Stephanie Folkens, who oversees Curriculum and Quality Assurance at Common Threads, started as a volunteer. She, like so many, was attracted to the organization because of her passion for teaching kids about nutrition and healthy eating. She explains that part of what kept her engaged were the "specific opportunities to volunteer directly with the kids that are served through the program." The bulk of Common Threads' volunteer opportunities involve direct interaction with the students. Many organizations offer predominately behind-the-scenes opportunities because of the specifics of their organization. The other reason Folkens explains that she continued with Common Threads is because, "I was able to see how much of an impact I was having because I continued on with the same group of students for the entire course." Part of the role of nonprofits in the new model of CSR is to adapt and offer corporations and individuals the right opportunities to get involved. A new and exciting trend emerging in volunteerism is virtual volunteering or microvolunteering. This involves employees working by phone or computer to assist nonprofits. Virtual volunteering allows employees to work in short increments on projects, many times digital ones on the computer. This setup also allows for greater productivity -- due to schedules, proximity, and the needs of the benefitting company. Virtual volunteering is a great solution in anticipating a generation of professionals who are tech-savvy -- the designers, data analysts, bloggers, and marketing gurus -- and gives them a way to hone their skills, while helping to change the world by using the digital tools they know best. My own organization has benefitted from virtual volunteering and is currently on the receiving end of volunteer hours provided by integrated marketing and public relations firm ext.54. The expertise they have provided for Common Threads is invaluable and has allowed us to implement initiatives with a current business approach that would not have otherwise been possible. Joel Morales, president of ext. 54, feels that "it's important for us to identify positive change initiatives that influence the industries we work in and lives we touch. Being able to provide my team an opportunity to use their skills for an organization that positively impacts the daily life of individuals/kids allows them to keep a level of passion for what they do day-to-day. Creating a sense of team pride and those moments that make what we do together all worth it." A Billion + Change is working with Points of Light, the largest organization dedicated to volunteer services, to get companies volunteering. Within its first two years, the organization had over 500 companies volunteering over $2B in service. It is currently working on a plan started in 2014 to expand to 5,000 businesses volunteering $5B of skills and services. Apart from organized and corporate volunteering programs, many individuals are putting themselves on the net, actively searching for volunteer work. More than 4 million LinkedIn members are looking to offer their skills to nonprofits! Almost three-fourths of these members are millennials - even more of a reason for corporations and nonprofits to prepare for a wave of do-gooders. The top industries these professionals are from are IT, Higher Education, Marketing & Advertising, Financial Services, and Hospitals & Healthcare. Skills in these fields are critical for nonprofits to keep up with a technologically savvy population and for the missions of nonprofits working to teach and provide nutritional or medical assistance. They are also often skills that a nonprofit budget cannot afford; in order to keep at least a 70% of funds going directly toward programming. SBV is a win-win for everyone involved -- corporations and companies, nonprofits, and society. Non-profits often require specific skills or resources that aren't always available internally. Leadership development and other similar services are often things that nonprofits do not have money to invest in; offering these as a volunteer can be more beneficial than a cash donation. Consultants, just like large corporations -- big and small -- have the opportunity through skills-based volunteering to give back and make a sustainable impact. Scott Peterson has spent the last 13+ years helping leaders build, lead and manage high-performing teams. Peterson founded Carver Peterson Consulting, and his leadership training provides a framework to improve communication between employees, their direct managers and companies as a whole. He has seen volunteering as a catalyst for many positive things. "The benefit for businesses is that their employees get an opportunity to learn, grow, evolve from other people and organizations in a truly relevant setting - because they are living and breathing it. For less experienced workers, it provides the chance to demonstrate leadership, plus apply professional skills in a real life, hands-on setting. It can build a lot of confidence--kind of like a med student doing rounds. But more than that, it's an opportunity for people of all levels to make connections that could lead to valuable introductions down the line," Peterson said. As individuals in the work force continue to seek companies looking to give back in a meaningful way, employers continue to engage in corporate responsibility in a multi-faceted approach. Davies states that the practical application of the 'enlightened' CSR and SBV "engages employees in doing what they know and delivering a societal value. It makes sense for their stakeholders, investors, and the public." Nonprofits stand to reap the benefits by adapting, thinking outside the box, and offering flexible opportunities for companies and their employees. Everyone wins. 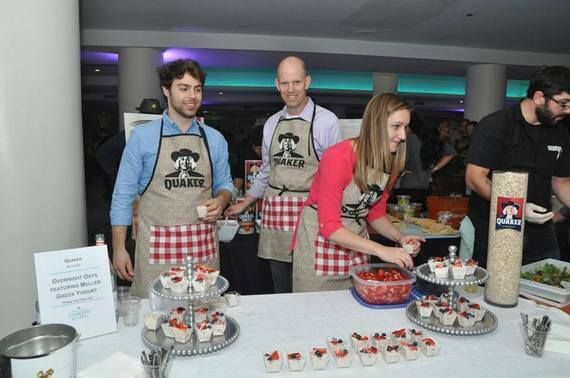 Quaker employees volunteer at a Common Threads' fundraising event.